Limes or chilis left over from the Chili Lime Butter recipe? Try this. It has been a family favorite at my house for years. Leave out the jalapeno if you like it milder. 1) Cut the cabbage into two quarters and cut out the core. Using a knife shred each quarter into whisper thin slices. The key here is bite‐sized and thin. If any pieces look like they might be awkwardly long, cut those in half. 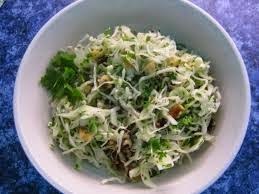 2) Combine the cabbage, walnuts, tomatoes, jalapeno (optional), and cilantro or parsley in a bowl. 3) In a separate bowl combine the lime juice, olive oil, salt. Add to the cabbage mixture and gently stir.